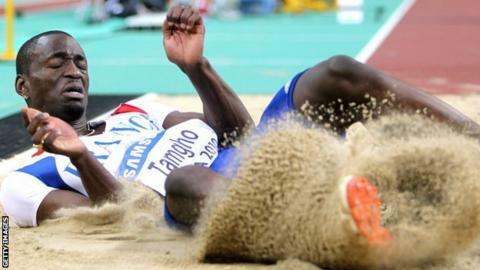 World indoor triple jump champion Teddy Tamgho of France will miss London 2012 because of an ankle injury. The 22-year-old, who posed a medal threat to Team GB jumper Phillips Idowu, announced on his Facebook page: "End of the season for me." Tamgho underwent surgery on a bone growth last week, and added that he did not want to jeopardise his career by returning to competition too soon. He also missed last year's world championships in Daegu through injury. Tamgho won the world indoor title two years ago with a jump of 17.90m, before breaking that record with a leap of 17.92m at the World Indoor Championships in Paris in March 2011. He was banned in December by the French athletics federation for an alleged physical altercation with a female athlete. His ban was initially for a year, but was then reduced to six months with six further months suspended - a duration which would have allowed him to compete in London in July.